This Thanksgiving I decided to make something different for dessert that I thought most everyone would enjoy, and they did! 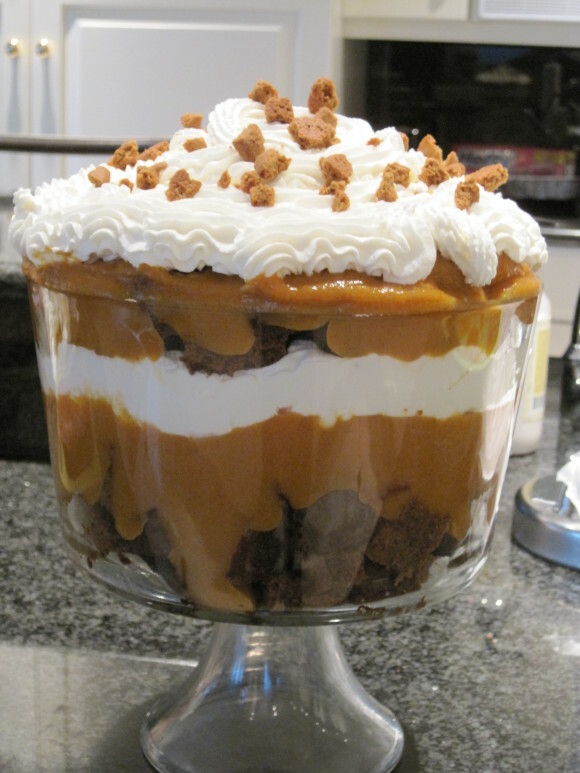 It was a Pumpkin Gingerbread Trifle. 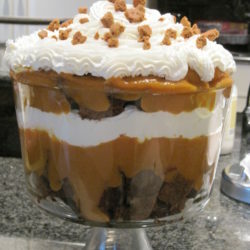 I will say that the next time I make this, and there will be a next time, I will layer them in Individual Trifle Bowls . I think that the presentation is beautiful in one large bowl however, unless you have an army of people that you’re serving you won’t make a dent in the trifle. Thus, leaving a half eaten bowl of a luscious dessert that’s difficult to store. I think arranging the ingredients in individual trifle bowls or deep small glasses with or without a stem would suffice and quite frankly wouldn’t take much more time to prep for. If you’re not looking for the WOW factor of presenting this dish you could even layer it in a 9×13 glass bowl. This dessert turned out so delicious! The colors layered together look like fall and although brown isn’t the most appetizing color of food, this dish was scrumptuous. I combined several recipes that I’ve used before plus a recipe for the Guinness Gingerbread Cake in Nigella Lawsons new book, Nigella Kitchen: Recipes from the Heart of the Home A great book with lots of wonderful recipes. This Gingerbread Cake is so good and moist. Although finding Lyle’s Golden Syrup wasn’t easy, I did find it at Global Foods here in St Louis, and it can be ordered online as well. You could substitute it with a light molasses but after tasting Lyle’s Golden Syrup I would definitely try to locate it in your area or order it. It had a smooth rich buttery taste, nothing that I had ever tasted before. It’s well worth it to find it. In addition, I had planned to make a homemade pumpkin pudding and was certain I had all the ingredients on hand. However, when I went to put them together I noticed I didn’t have enough of one ingredient. So I used 2 packages of instant vanilla pudding that I had on hand, then added the pumpkin pie filling and doctored it up a bit as you can see below in my recipe. It turned out as good as homemade. The whipped cream filling and topping I make this way, so that it holds up and doesn’t collapse. It’s perfect for fillings and quite tasty. I hope that if you try this recipe, you will love it just as much as my family and friends did. In fact, it improves with flavor as the days go by without the gingerbread getting soggy. Put the butter, syrup, dark brown sugar, stout, ginger, cinnamon and ground cloves into a pan and melt gently over a low heat. Whisk the sour cream and eggs together in a measuring jug and then beat into the gingerbread mixture, whisking again to get a smooth batter. Pour this into your cake/foil pan, and bake for about 45 minutes; when it's ready it will be gleamingly risen at the centre, and coming away from the pan at the sides. Prepare vanilla pudding according to package instructions. Combine pudding with the pumpkin pie filling. Fold in brown sugar and spices. Cover and chill. Beat cream with sugar and vanilla using mixer until it holds soft peaks. Put half of gingerbread cubes in 2 quart trifle bowl. Top with half of pumpkin pudding, then half of the whipped cream. Repeat layering once more with all of remaining gingerbread, pudding, and cream. Chill at least 2 hours before serving. Best if assembled the same day. Trifle can be made in a large trifle dish, Individual Trifle Bowls or deep glasses. Gingerbread (uncut) can be made up to week ahead. Wrap in parchment paper followed by a layer of plastic wrap and stored in an airtight container in a cool place. Gingerbread will keep for a total of two weeks. Trifle, can be made a day ahead but will look best if prepped the day you serve it.